“Access to justice is the most basic human right” and there must be emphasis upon the need for competent legal aid lawyers providing effective legal representation. There are 1,401 jails in India and each jail should have a legal aid clinic. CHRI received information through RTIs on existence and functioning of jail legal aid clinics (JLACs) from 659 jails. This Report is the outcome of CHRI Africa’s research conducted to aid the process of establishing an independent police oversight mechanism. The Report synthesizes best practices from selected countries and recommends a good mix of factors to be taken into account when fashioning a mechanism for Ghana. October 2nd is a day about respecting the rule of law and the fundamentals of a democratic and just society, just as Mahatma Gandhi and Lal Bahadur Shastri had envisioned. To further the need to protect and safeguard the rights of accused persons, CHRI puts forth two publications. The Commonwealth Human Rights Initiative (CHRI) joined by the undersigned Commonwealth, international, and regional civil society groups draw the attention of CMAG to the number of indiscriminate killings, arbitrary arrests, detention without recourse to justice, and torture in Cameroon. The Commonwealth Human Rights Initiative had produced an early draft of the Kenyan Manual for Katiba Institute. Eventually the project was taken under the wing of the Kenyan Judiciary, who raised the necessary funding. 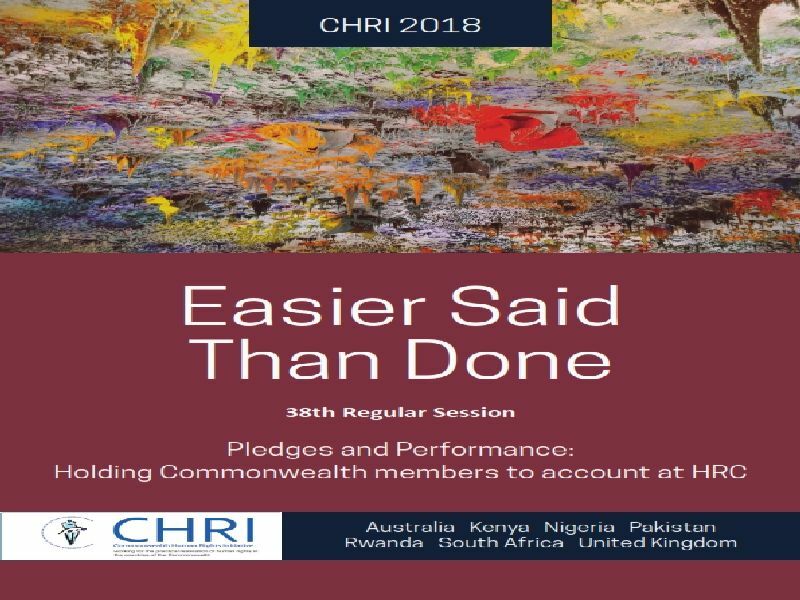 Pledges and Performance: Holding Commonwealth members to account at HRC Since the inception of the Human Rights Council (HRC), the Easier Said Than Done (ESTD) series has reviewed Commonwealth member states’ performance at the HRC. 39th Regular Session of the UN Human Rights Council Date: 20 September 2018 Item 6: UPR Outcome of Cameroon Joint Oral Statement delivered by Mr. Joseph Désiré ZEBAZE1 on behalf of Commonwealth Human Rights Initiative (CHRI) Thank you, Mr. President. 39th Regular Session of the UN Human Rights Council Date: 20th September 2018 Item 6: UPR Outcome of Bangladesh Oral Statement delivered by Yashasvi Nain on behalf of Ain o Salish Kendra (ASK) and Commonwealth Human Rights Initiative (CHRI). Thank you, Mr. President. 39th Regular Session of the Human Rights Council Item 4: Human rights situations that require the Council’s attention Date: 18th September Oral Statement by Mr. Yashasvi Nain in behalf of the Commonwealth Human Rights Initiative (CHRI) Thank you, Mr.